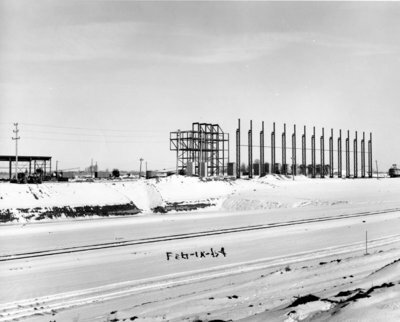 A black and white photograph of the main building of Lake Ontario Steel Company Limited under construction. The land for Lake Ontario Steel, at the south end of Hopkins Street, was purchased in August 1963, and construction proceeded from December 1963 well into 1964. This picture shows the framework for the main building under construction. Lake Ontario Steel Company Limited, February 9, 1964, Bill Stannett. Whitby Archives 15-021-002.